Two days removed from the No Mercy supercard, WWE's Smackdown brand was in San Jose, California with a card headlined by World Champion AJ Styles facing hand-picked opponent, James Ellsworth, with Dean Ambrose slotting in as the special guest referee. 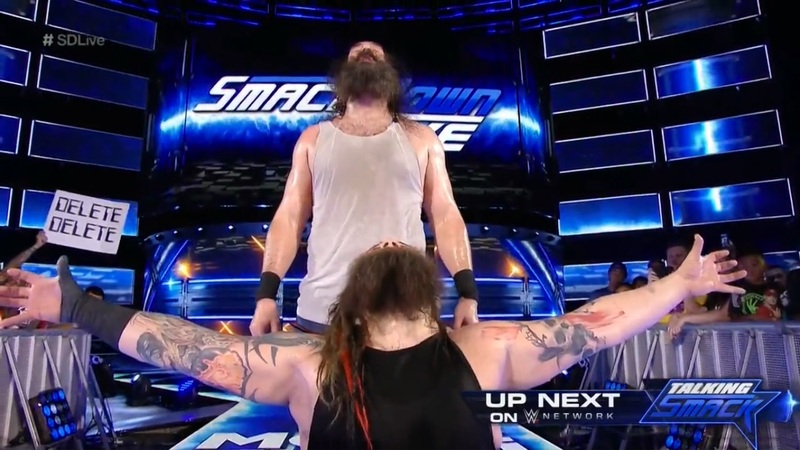 With Kane, Randy Orton, NEW Intercontinental Champion Dolph Ziggler, Bray Wyatt and a returning Luke Harper getting major spots, would Smackdown come out of swinging as the brand began it's journey towards Autumn's biggest event, Survivor Series? So, yeah, this week's main event saw World Champion AJ Styles pinned by lowly underdog job guy James Ellsworth. I'm not entirely sure how I feel about this and it was quite possibly one of the hardest matches I've ever had to give a rating to. For a bit of context, Dean Ambrose played the role of special guest referee and, of course, gave Ellsworth every opportunity he could. This included various comedy spots, Ambrose tripping Styles and seemingly taking a phone call just as Ellsworth tapped to the Calf Crusher. Of course, after Styles had hit a Styles Clash (that would have broken Ellsworth's neck, had Styles not been able to shift his weight at the last moment), Ambrose refused to count the pin and went on to hit two Dirty Deeds to give a limp Ellsworth the win. I found it all mildly entertaining, but not all that funny and I'm not quite sure what it achieves in the long run. With six weeks of television to fill before Survivor Series, I can see why a side story was needed and I understand why Ellsworth was chosen for his cult stardom, but the whole shape of the match felt backwards and I'll go into a bit further down. The semi-main was Luke Harper's return to action for the first time since March, tagging with Bray Wyatt for a victory over Randy Orton and Kane. I wasn't particularly enamoured with main bulk of the contest, which mainly consisted of Orton and Kane getting beats on, feeling like every piece of Wyatt Family offence was responded to with five or six things from the makeshift babyface team of former WrestleMania opponents. I'm not sure what was up with Kane because his offence was sloppy and he took a poor bump into the barricade. A sub-par performance from a guy who is usually reliable for this kind of spot. For all the awkwardness of the build to finish with Kane arguing with the ref, giving Harper a chance to slide in a hit a superkick on Orton, the actual finish was pretty damn cool. Moments after the superkick, Wyatt missed a running senton and with both men reaching for the tag, the lights went out, Wyatt's screen gimmick hit and when they came up, Harper was standing in Orton's corner and Kane had completely disappeared. It looked fantastic and was worked quickly enough that it got a good pop out of the crowd. Wyatt won the bout with a Sister Abigail on Orton. With Harper back there's potential to create some interesting stuff with Orton and Wyatt, parts of the match touched on how good it could be, hopefully it's those parts that are empathised going forward. So, I've explained the Styles v Ellsworth bout, but not quite how it came about. It all began with what was probably the strongest work of the show as Styles dazzled on the microphone with a powerful egotistical promo. He spoke about his victory at No Mercy, bragging about his beating John Cena and Dean Ambrose in the same night, glossed over the fact that he tapped out to both, as well as playing with the crowd, initially basking in a portion of cheers, before burning those cheering, by saying that they had to live through him. After a short interlude where Dean Ambrose claimed Styles was afraid to fight him, Styles announced his hand-picked opponent as James Ellsworth, who confusedly walked down the ramp, apparently unaware. The segment would conclude with General Manager Daniel Bryan making Ambrose the special guest referee. As mentioned above this didn't quite sit right with me as stacking the deck against a champion, having the Authority figure place a crooked referee in charge, almost makes Styles the match's babyface. The opener saw the new Intercontinental Champion Dolph Ziggler get a victory over The Spirit Squad duo of Kenny (Dykstra) and Mikey (Mondo) in a Two-on-One Handicap match, that would hopefully put that story to bed. The match went too long for me, which might have been something to do with them airing it through the advert break. 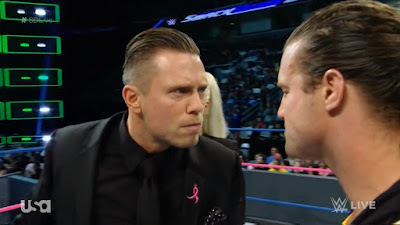 With The Miz on commentary, I would have bought more into the action had he been more involved in the action, giving the distractions that allowed Kenny and Mikey to take control. The bout plodding along for four or five minutes and I just couldn't buy into the Spirit Squad as threat. The double DDT spot by Ziggler was nice, but having the momentum switch back and give Kenny a near fall felt unnecessary at this point. The most interesting thing that came out of the match was Tag Team Champions Heath Slater and Rhyno making the save for the victorious Ziggler, as Miz and Spirit Squad attempted to take him out post match. Before the bout, Dolph Ziggler opened the show with a hot crowd hanging on his every word. It was the right decision to start the show with the hottest storyline that the show had coming out of No Mercy and Ziggler took the moment and ran with it. He built his promo wonderfully, talking about his feelings before his retirement match and concluded with a passion declaration that he belonged in this ring. He also made the belt feel like a big part of what he had to say, constantly referencing what it meant to him and making sure to hold it aloft at every opportunity. The Miz and Maryse's interruption also featured some good content, with the highlight having to be the pair dressed entirely in black and supposedly being in a period of mourning for Miz's title loss. Whilst Ziggler and the crowd taking the piss out of Miz for seemingly crying on Sunday at first didn't sit right to me, Miz rallying out with a fiery speech, saying that he'd do absolutely anything to get the title back and leading into introducing the Spirit Squad for the aforementioned handicap match. Naomi pinned Carmella after Nikki Bella caused a distraction at ringside, with Carmella eventually able to escape an attack from Bella by running through the crowd. Show in a Sentence - Strong promos, ineffective matches and questionable stories. Only a short episode of Talking Smack this week, but an interesting one for sure. 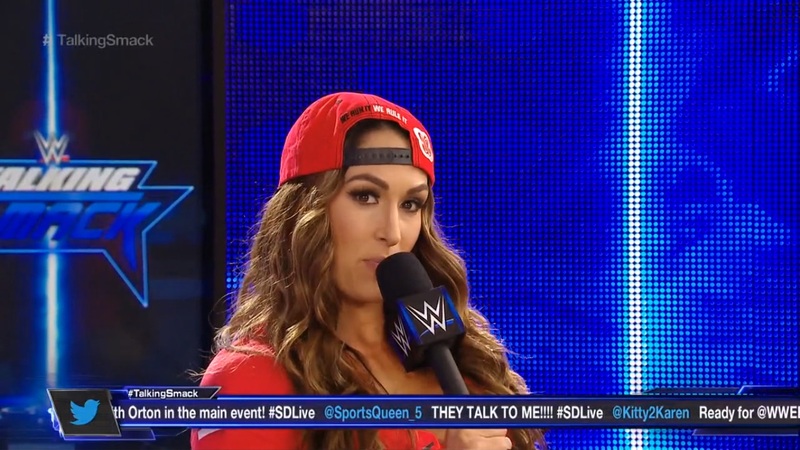 Nikki Bella's interview was the headliner, but there was a lot going on elsewhere also. I found myself rather enjoying Renee Young and Daniel Bryan interviewing Nikki Bella, in a way that I perhaps didn't expect I would. This was mainly because Bella felt like she being real, rather than attempting to deliver a promo or play a character, whilst still remaining true to current storylines. This was helped by her chemistry with brother-in-law Bryan, which came across well as they joked and teased each other. A really good plug for the Total Bellas reality show. I would have liked to have seen Bella discuss her feud with Carmella a bit more, as well as sell the attack from Carmella earlier in the night, but perhaps that is asking too much? Show in a Sentence - A nice way to round out the evening, with some brave experiments with different styles.